The Thru’penny Bit is just the first coin in a prestigious set of historic coins - The Changing Face of British Coinage - Queen Elizabeth II Pre-decimal Edition. This original coin, now 80 years old, has been preserved for posterity, layered with pure 24 carat Gold with the main design gloriously accented in red, white and blue - the colours of the Union Flag. This is a delicate and time-consuming process, one that makes the Pre-decimal Threepence even more special. A fitting tribute to our nation’s heritage. The coin features a design of a Tudor chained portcullis – a badge of government - with chains and a coronet. The portcullis was first used on the overseas or trade coinage of Queen Elizabeth I. 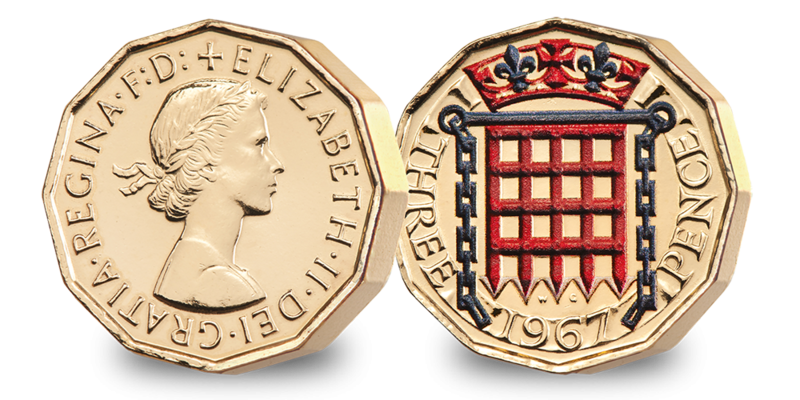 This exceptional design which was inherited by the 1p piece after decimalisation and remains on the coin today, as well as being the badge of the Palace of Westminster. By ordering The Golden Portcullis Threepence, each of the remaining eight coins in the Changing Face of British Coinage Collection will be sent to you at monthly intervals, for just £29.95 each, always on approval and without obligation, simply chose which coins you wish to keep. This enables you to build the collection you want, at your own pace, without the worry of missing out. When you order The Golden Portcullis Threepence, you will also receive the official Collector's Presentation Folder, which stores and displays your coins safely and elegantly. It includes a Certificate of Authenticity guaranteeing the specifications. Together they provide important historical background information about British heritage coins. An enduring piece of history that is sure to be treasured. Minted at the start of Her Majesty’s reign, these are coins that, quite literally, belong to a bygone era when money still had ‘the look’ of money. Don’t miss this opportunity to literally hold a piece of our history in your hands.In this, the Queen’s Sapphire Jubilee year, nothing could be more timely than securing the complete set of coins from the start of her reign.